Today was an interesting day. It started with this fellow in a robe coming up to me. He had the most intense gaze and this magical, calming voice. I remember that we spoke — he said something, but I can’t quite recall what it was. 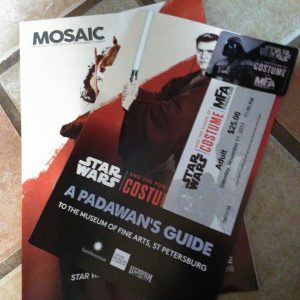 The next thing I knew, he was gone and I found myself with an overwhelming compulsion to go and visit the Star Wars and the Power of the Costume Exhibit at the Museum of Fine Arts in St. Petersburg. Anyone who has seen any of the Star Wars franchise knows about the remarkable costumes within: Darth Vadar’s black ensemble emblazoned him as one of the most recognizable villains in Hollywood history. Emperor Palpatine’s monk-like outfit hid the most hideous evil in the universe: the face of a truly corrupt politician. And every fanboy drooled over Princess Leia’s slave outfit, which was, I learned, based upon the dancing women outfits of 1930s and 40s cinematography. Imagine having a close up view of all of those costumes in a smaller intimate setting — I can tell you, this show is out of this world! The buzz about the show started about 8 months ago with the original announcement that the Museum of Fine Arts, St. Petersburg, was chosen to host the show. Interest has built over the ensuing months. Teaser photos have emerged in the media. I, as a member of the MFA was offered a chance to preview the collection. It was well worth the effort to secure the tickets to go. 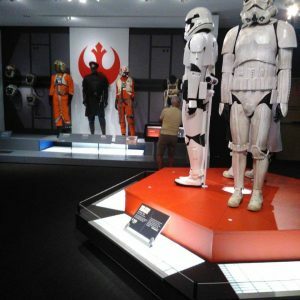 So, on a sunny, cool Saturday I arrived at the doors of the museum, where I was greeted by Stormtroopers and Boba Fett. (The costumed Darth Vadar was wandering through another part of the building when I arrived). The ticket areas were at the end of a long red carpet, making the event even more memorable. I was offered a Mosiac publication detailing the events accompanying the show. (Special note: I am participating in this event as a conversation moderator with Lucasfilm Vice President and Executive Creative Director Doug Chiang on December 6. Program is 6:30 – 7:30 PM with a reception to follow). The show is housed in the new wing of the MFA, specially decorated for this event. Upon entering the first room, one is greeted with one of the many outfits of Padme from the second (first!) trilogy of films. Her outfits are the most prolific of the exhibit, but with good reason. Other costumes shown date back to the original movies that aired forty years ago. Leia’s futuristic wristwatch is one of the featured images, as is the flight suit of Luke Skywalker, the yak-fur filled costume of Chewbacca, and the impressive leather-based suit that clad Darth Vadar. But the art show gives more than just a view of the costumes — it gives some of the insight into their creation. Darth Vadar was based on a Samurai, German solider, and other dangerous figures from human history, all fronted with the dreadful image of a gas mask for a face. Different rooms are devoted to various themes. 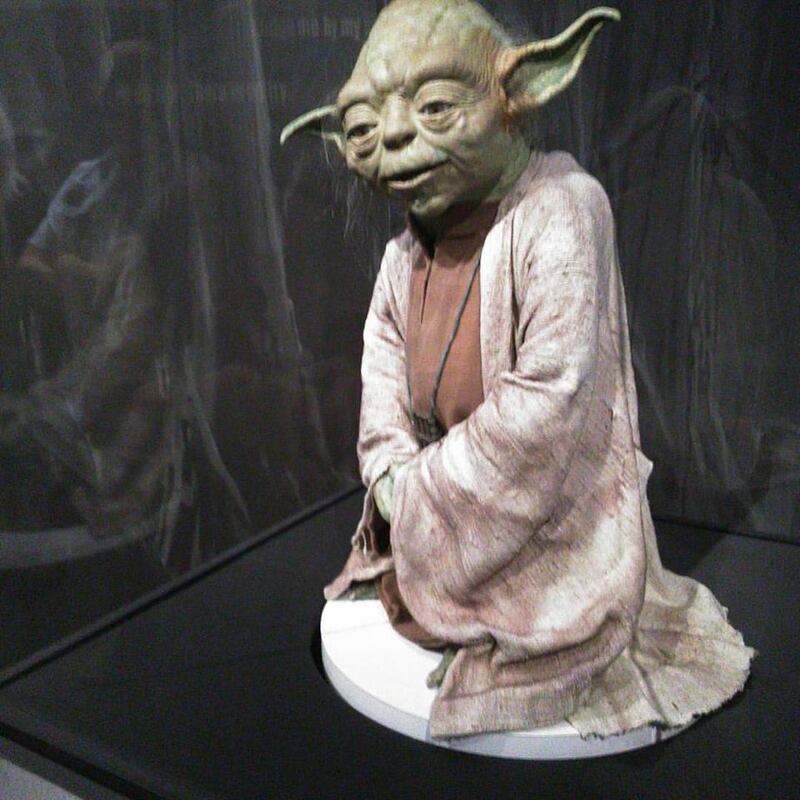 The droids that you were looking for, Yoda, and even Ewoks adorn the show. Padme has her own room on the second floor of the building (be sure not to miss that). 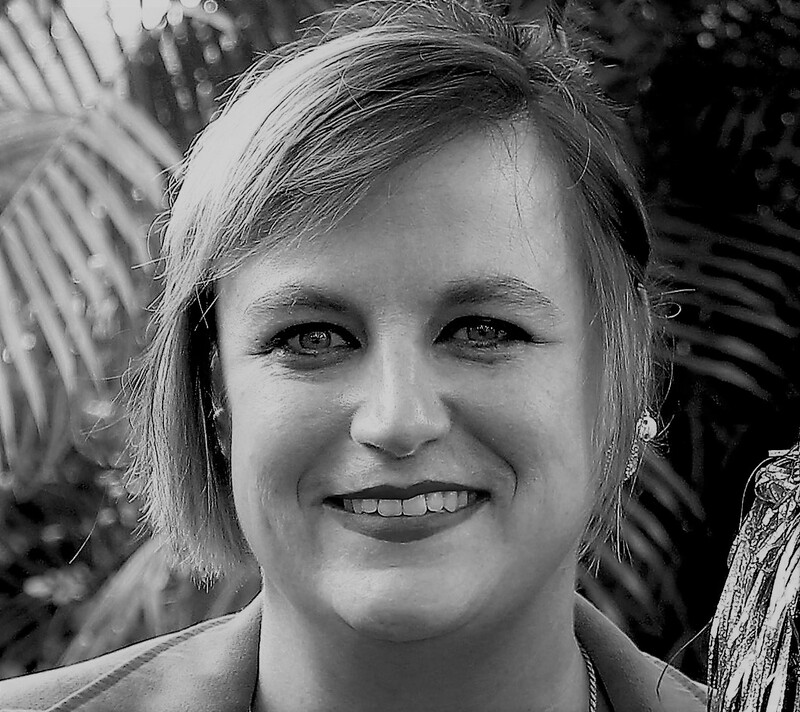 Her costumes there include her transformation from a queen and senator to a fighter, and finally to a wife and mother-to-be. (Yes, her wedding gown is present, as is a maternity dress). One of the most surprising elements of this show was to discover how petite the actress was — Padme is a delicate (if eccentric) figure if judged from the costumes alone. And what is a Star Wars show without a villains room? Be sure to check out the image of the Emperor perfectly set with dark force blazing from behind the costumed manikin. It is as if he is ready to zap every person in the room and makes for a fantastic (flash free) photograph! The Star Wars and the Power of Costume show opens November 11, 2017 and will be on display through April 1, 2018. Adult tickets are $25.00. There are no docents for the show, but audio tours are available. There are two forms of the tour available: one for adults and one for children. This is a wonderful afternoon to spend with any sci fi geek, their families and children. It gives a great connection to the Star Wars franchise and is a show that won’t be forgotten!